Beauty and Health Remedies: Is Your Back Pain Killing You? Is Your Back Pain Killing You? Living with a killer back pain and running your day to day chores can be quite a problem. Especially if you are a mother, you can hardly get the rest that is really important to get rid of that unbearable back pain. How many of us actually do something about our back pain even when it becomes unbearable? The best effort we put in is to apply an ointment or take a pain killer once in a while to relive the back pain and then forget about it until the back pain returns and hits us twice as hard. Here are some excellent remedies I have always advised women who suffer back pain problems. 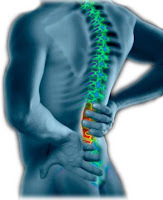 These remedies have shown excellent results and are famous for curing back pain significantly. Soak the wheat over night in water. The next morning, pour the cuscus grass and coriander into the water. Mix it thoroughly until it turns into a paste. Now take milk and boil the paste in it till 2/3rd of the liquid is left. Drink this once a day to cure back pain. It is considered as an extremely effective home remedy to relieve back pain on long term basis and improve the digestive system. Drink honey mixed in a cup of hot water to get rid of your annoying back pain. My grandmother has always practiced drinking a cup of hot milk with a pinch of turmeric (haldi) powder in it after breakfast. She is 80+ and has never experienced back pain or joint problems like most women develop in later ages. Mix sugar candy and cuscus grass and have 6 grams of this everyday with milk to cure back pain. Exercise is also effective to treat back pain, which may be due to immobility or excessive bed rest. It helps to create flexibility in the bones and increases blood circulation through the spine, which in turn reduces back pain over the period of time. Rest for 2 hours flat on your back on the floor. This helps to cure back pain as the back gets the best posture this way. We mostly fail to give our back the comfort it needs and instead sleep on soft mattresses that can be the root cause for persistent back pain. Boil cabbage leaves in milk until it resembles jelly. Spread this mixture on a cloth and put this pack on your body area where you feel back pain the most and leave it overnight as long as you can. It kills the back pain as if it never existed. Don’t use soft cushions or seats. Use a hard mattress to sleep on and prefer to sleep on the floor with knees bent at a 90-degree angle to your body while sleeping on the side. Fry 10 garlic cloves in coconut oil or mustard oil and use this garlic oil to massage the back. It relieves back pain significantly once it starts penetrating the skin. Arthcare oil is excellent to relive body and back pain. It works as effective penetrating oil and has an anti-inflammatory effect that cures back pain within no time. If you are not a blood pressure patient then mix lemon juice (1 table spoon) with a little bit of salt and have it twice everyday. It will definitely relieve back pain and you won’t have to worry about taking medications. Apply hot water bottle or heat packs on the area where the back pain is concentrated most. Rub raw potato on your back where the back pain persists. Mint oil massage is an excellent remedy for back pain. Mint is used in most back pain ointments too.